This is a review of Protégé Luminate Natural Skin Lightening Cream. 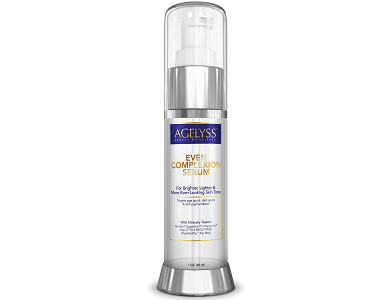 The manufacturer claims that this product will protect and nourish skin while naturally blocking skin pigment from forming, therefore, restoring skin to a youthful glow. In saying so, will this product be the best skin whitening solution available on the market? Our review will examine various product aspects, such as formula and customer support, to help you determine if this is a wise product purchase for you. 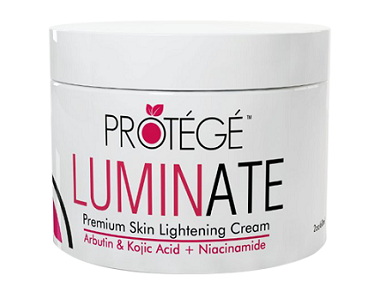 What’s in Protégé Luminate Natural Skin Lightening Cream? Arbutin is a popular ingredient in skin lightening products for its ability to slowly release hydroquinone which, in turn, reduces the skin’s melanin production. Kojic Acid is also a lightening agent that reduces the appearance of scars and sun damage on the skin. Vitamin B3 is a restorative ingredient that evens and brightens skin tone while strengthening skin and reducing fine lines. These ingredients act to lighten skin to deliver a more youthful glow. However, the lack of patented ingredients is a concern. Ingredients like skin-tone-evening Alpaflor Gigawhite, brightening REGU-FADE (which delivers results in just 2 weeks of use), and protective PhytoCellTec Alp Rose are a few of many patented ingredients included in alternative products to deliver effective results. In saying so, the lack thereof is worrisome as we are uncertain as to the quality, therefore, the efficacy of this formula. There is no mention of this product being cGMP certified or cruelty-free, which is worrisome as the quality and ethics of the production process are in question. How Do You Use Protégé Luminate Natural Skin Lightening Cream? The manufacturer doesn’t provide very clear instructions on how to best use this product. The only state that this product should be used for up to 3 months to deliver results and should be used in conjunction with a sunscreen. As this product does not already have a protective element to it, this would come at an additional cost to the customer. Whatsmore, the lack of concentration prevents us from stating if this product is in fact, effective or not. 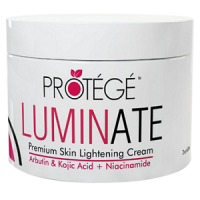 You can purchase a tub of Protégé Luminate Natural Skin Lightening Cream from the manufacturer’s website for $24,99. This price was reduced from $49,99 and the discount is said to only last for a few hours. However, this may be just a marketing scheme to create urgency as the sale was still valid after a few days, meaning that the ‘sale’ just reset itself after every few hours or so. There are no patented ingredients to justify this price and the lack of bulk offers may make this product use become costly in the long term. The manufacturer claims to offer 100% satisfaction guarantee with a full refund if products are unsatisfactory. However, this policy is vague as customers do not know how long this policy is applicable for or if partially used products apply to this policy. There are also many negative customer reviews on this product, with a variety of customers complaining that this product was ineffective in delivering results. Another customer even experienced negative side effects which included inflamed, red, irritated and itchy skin after use. Protégé Luminate Natural Skin Lightening Cream has a variety of popular products that may support lighter and brighter skin. However, the lack of the concentrations of these ingredients, as well as the inclusion of any patented ingredients, could suggest that this product is less effective than alternative brands on the market. The lack of clear instructions for use or a legitimate customer refund policy suggests that the customer support provided by the manufacturer is way below the market standard. While the price may seem affordable, the use of an inaccurate countdown and no bulk offers discourages the purchase of this product. For these reasons, we do not recommend this product.